68 Heavy Duty Power Harrow Cat I/II. 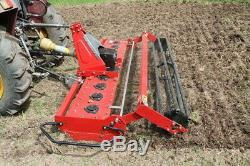 The power harrow is an implement for seed bed preparation and weed control. There are many advantages using a power harrow. Ideal distribution between fine soil in depth and larger sods on the surface, which prevents a surface crust from forming. The rotary blade movement exercise a horizontal and not a vertical pressure on the soil, preventing the formation of a hard layer at the depth. Versatatility and all-purpose use: adaptation to most soil conditions and excellent capability of working virgin land. Optimal stubble/trash burying in the upper soil layer. In particular, the use of specific blades (on grip) produces a perfect soil re-mixing even in large amounts of stubble/trash. Easy depth control allows quick easy shallow weed control. 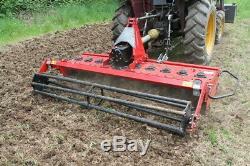 The rotary plough will leave the soil with worms still intact and alive - aiding the natural structure of the soil. Perfect for cover crop mixing. The spade blades lift and tumble the soil, thoroughly mixing it, breaking up any clods and leaving a prepared and undamaged soil structure, which is fully de-compacted and aerated. This ability to mix and blend, is a huge advantage when incorporating stubble and previous crop residues, as well as large qualities of composts, slurry, manure and other organic materials. Gear Box HP: 50 HP. Tractor PTO HP: 30-45 HP. Will attach to the following Tractor Brands with Cat. John Deere, Kubota, Massey Ferguson, Ford, New Holland, International, Jinma, Yanmar, Mahindra, Montana, Branson, Case, Cub Cadet, Farm Pro, Farmall, Foton, Iseki, Kioti, Mitsubishi, Nortrac, Rhino, SAME, Satoh, TYM, Tytan, Zetor. Local pick-up available at our location on weekends by appointment only. Use at address that is not yours, is considered commercial use. Consumable, Expendable, Wear Items Examples:Rubber & plastic parts, hydraulic hoses, belts, tires, cables, blades, tines, wedges, teeth, tips, chains, pins, brushes, filters, etc. Assumes no responsibility for labor. PERMISSIBLE BY APPLICABLE LAW, BETST PRODUCTS, LLC. THE FOREGOING EXCLUSIONS OF IMPLIED WARRANTIES DO NOT APPLY TO THE EXTENT PROHIBITED BY LAW. PLEASE REFER TO YOUR LOCAL LAWS FOR ANY SUCH PROHIBITIONS THERE SHALL BE NO LIABILITY FOR PRODUCT LIABILITY OR LIABILITY ON THE PART OF BETST PRODUCTS, LLC. Or any authorized agent liable for injury or damages of any kind or nature, direct, consequential, or contingent, to person or property. The sole and only remedy in regard to any defective products shall be the repair or replacement thereof as herein provided. Agent(s) of Betst Products, llc. Shall not be liable for any consequential, special, incidental or punitive damages resulting from or caused by any such defects. Consumable, Expendable, Wear Items Examples: Rubber & plastic parts, hydraulic hoses, belts, tires, cables, blades, tines, wedges, teeth, tips, chains, pins, brushes, filters, etc. Assumes no responsibility for outside labor. The item "66.9 Heavy Duty Power Harrow Cat I/II VL-LXG170" is in sale since Wednesday, December 12, 2018. This item is in the category "Business & Industrial\Heavy Equipment, Parts & Attachments\Heavy Equipment\Tractors". The seller is "betstco" and is located in Creswell, Oregon. This item can be shipped to United States.